Nike Pro's Magical Kaleidoscope collection has you geared up for Spring with their limited edition bold printed dri-FIT fabrics. These festive spring prints and colors should be enough to convince you to tone up if motivation is lacking. I mean come on, how can you not stop moving with these busy bee prints? That's the whole point! Nike collaborated with Japanese artist Yuko Kanatani on this limited-edition print. Inspired by magic and the movement of circus performers, this intricate hand-drawn pattern features a colorful collage of lines and shapes. This is where support meets style. The limited-edition Nike Pro Magical Kaleidoscope Women's Sports Bra combines excellent support, sweat-wicking comfort and vibrant graphics for the latest twist on a favorite style. The compression fit offers exceptional support while nylon stabilizers in the straps reduce stretch for extra support and less bounce during quick, multidirectional movements. The decorative prints on the tights are completely hand drawn and composed of intricate shapes and rich textures that come to life as you move. The wide elastic waistband offers a slimming fit, and the reduced seams provide a smooth feel while minimising irritation caused by chafing. Opulent prints and playful design make each Nike Tight of the Moment special. Produced in limited quantities, they're as immediately collectible as they are rare. 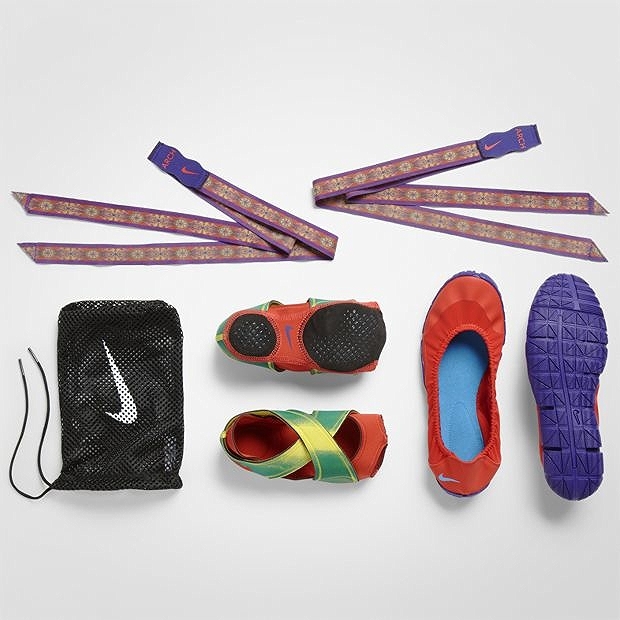 The innovative Nike Studio Wrap Pack Magical Kaleidoscope Three-Part Footwear System is designed to help you make the most of workouts typically done in bare feet. Made up of a wrap, a ribbon and a flat, this three-part footwear system combines lightweight protection, traction, support and style. Designed to offer a barefoot-like experience for workouts like Nike Training Club Toned, yoga, dance and barre, the Studio Wrap offers hygiene protection and traction to help prevent slipping. It's made of stretch foam material that crisscrosses over the top of the foot and wraps around the arch and under the heel for support where you need it. This entire ensemble is a must have! I'll be starting Moksha Hot Yoga classes this week and this entire sports attire will definitely have me covered. I'll be able to remain comfortable and dry while maintaing some sort of cuteness (in loud prints) while sweating like a dog. I can't wait to get my hands on these!